I’m lying. What I actually said upon learning that we were heading to Costa Rica was that I needed to see a step pyramid. It would be a few more days before I discovered that there are no step pyramids in Costa Rica. The country is a blank spot between all the tessellated stone spikiness of Mesoamerica and South America. 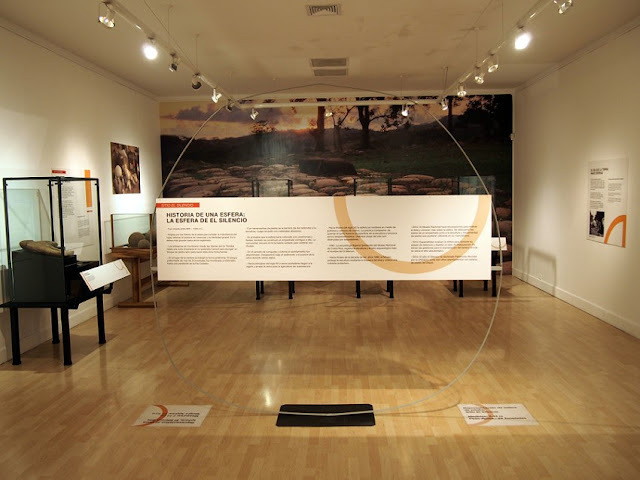 In fact, there are little in the way of any kind of archaeological structures in Costa Rica. But they do have Diquis Spheres. And that’s not shabby. Diquis Spheres are smooth, round balls of hardened lava that range from murder weapon size to weapon of mass destruction size. Basically, a few inches to about eight feet in diameter. The largest that we know of weighs 24 tons. They’re polished to near-perfection, sometimes include surface carvings, and are obviously artificially created. These aren’t artifacts of time and natural processes. And they’re mysterious. But not in the aliens and Atlantis kind of way, although you’ll find those theories on the scarier/more fun parts of the Internet. We just don’t know a lot about who made the spheres nor why, and that’s mostly due to the murkiness of Costa Rica’s unrecorded past. But we have guesses. We always have guesses. Since then some 300 of these 1,000-year-old stones have been dug up from the ground. Archeologists think they might have been used to mark important sites or as status symbols. 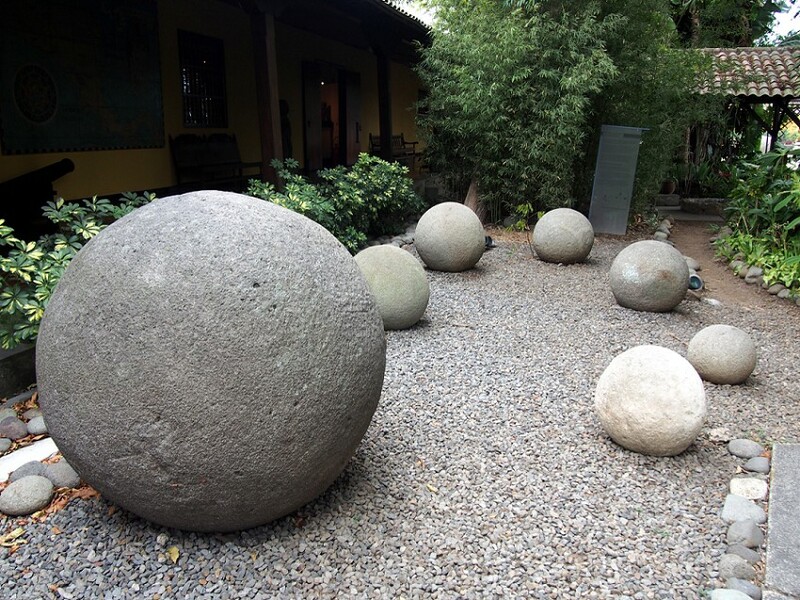 Because, you now, what practical use could stone balls be? I counter that question with the theory that they’re ball bearings for giant stone machines shaped like crocodiles. But the peer-revieweds keep rejecting that paper. The status symbol theory comes from the idea that it took a lot of work to polish these boulders into spheres using pre-Columbian methods. And, of course, the bigger your balls, well, you know how that goes. I don’t. 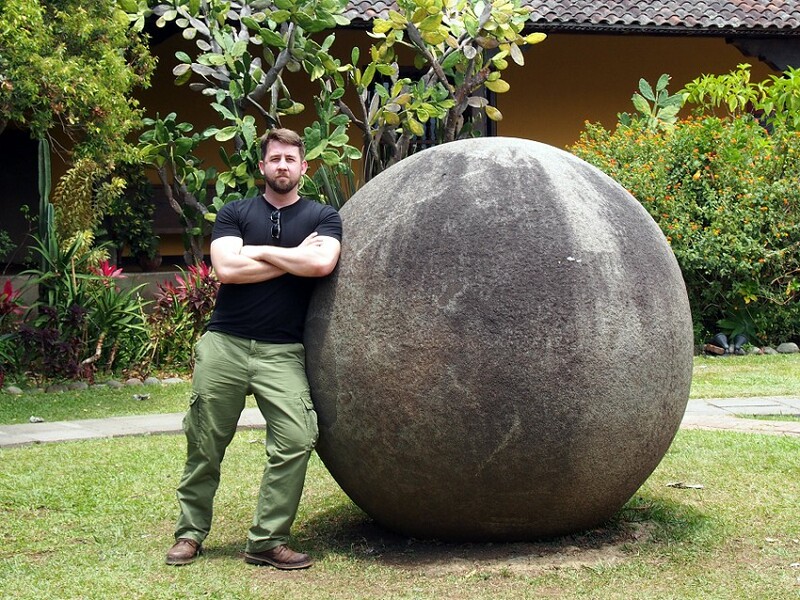 So those with the most cultural prestige were able to get massive spheres to sit on their lawns and invoke jealousy from their neighbors the same way we do with the size of our garage. And, today, the stones are still used that way. As we drove around the country we saw them set in the front lawns of houses, at the entryway to businesses, in the middle of parks. The cool part of that is, well, people get the awesome ancient equivalent of garden gnomes to decorate with. 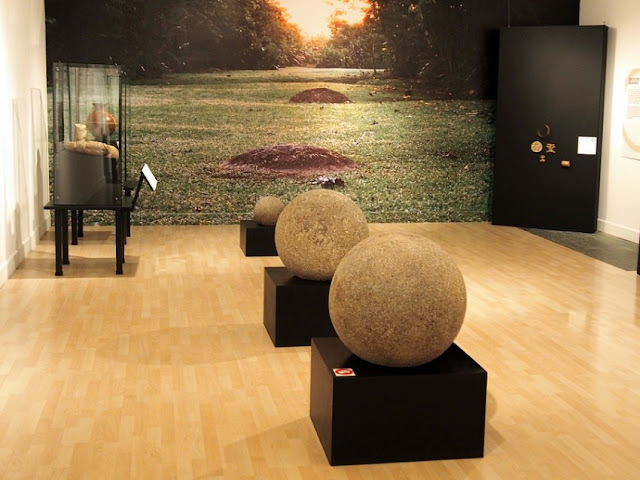 The bad part is, most of the spheres were removed from their original site prior to thorough archaeological documentation, so we lost a lot of the context for how the spheres were initially situated (some were even broken apart to see if there were prizes inside. There weren’t.). 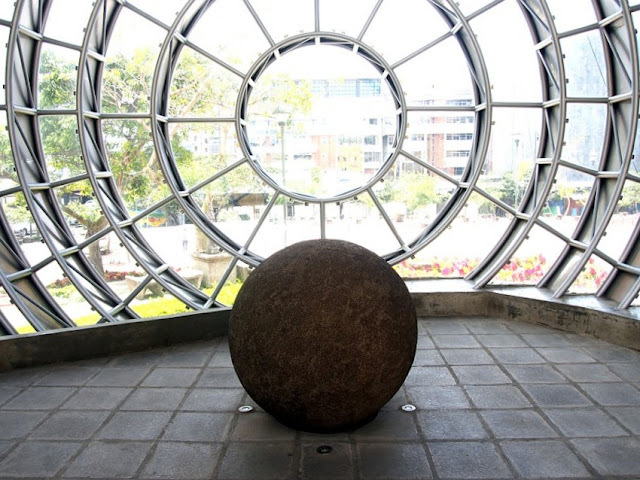 But it wasn’t until we got to San Jose that we got some up-close time with the Diquis Spheres. 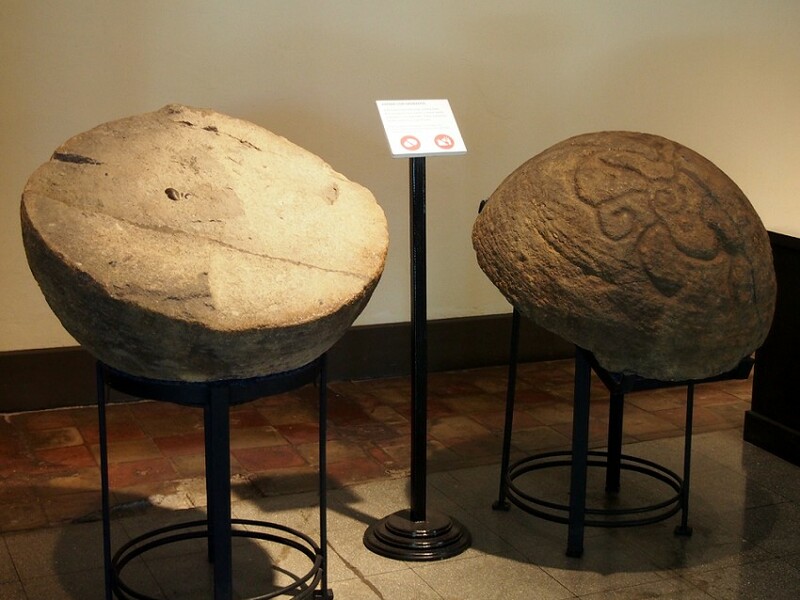 The Museo Nacional de Costa Rica is a catch-all museum for the country. Housed in a large, 100-year-old yellow fort still pockmarked with bullet holes, it features small exhibits on everything from natural history to ancient artifacts to contemporary art. 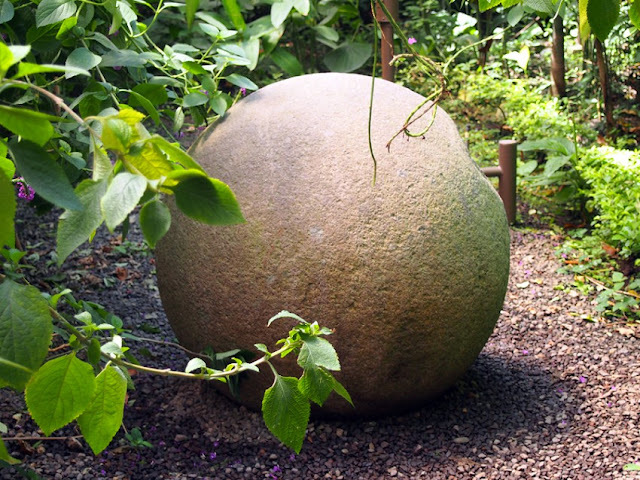 And about two dozen Diquis Spheres are spread throughout the place. The smaller ones were in cases, but once they passed basketball size, they were usually just placed in the open to allow visitors the thrilling opportunity to touch millennium-old workmanship. The first we came across was enclosed in a glass sphere outside the front entrance, so you don’t actually have to enter the museum to see one. The next one we saw was inside the museum’s butterfly garden. They were also scattered throughout the exhibit on ancient artifacts as well as across the interior courtyard. That’s where we saw the largest one. It was about five or six feet tall and slightly lopsided. Like the other spheres in the museum that I had by that time put my fingerprints all over, the surface was rough, like old poured concrete, but obviously worked over to the point that it can still be called smooth, if that makes any sense. There also happened to be a temporary exhibit on the Diquis at the time of our visit, which featured more spheres, as well as a two-dimensional outline of the largest one ever found. That’s the 24-tonner. Diameter-wise it was probably a good two or three feet bigger than the large one in the in the courtyard and probably pretty close to the one that chased Indy at the beginning of Raiders of the Lost Ark (now you don’t need to email me. The reference is made). That stone is still in-situ at the El Silencio site in the Diquis Delta—I assume because big—set there where God put it while he turned in his bowling shoes. The images online of it are stunning. Representation of the El Silencio stone. 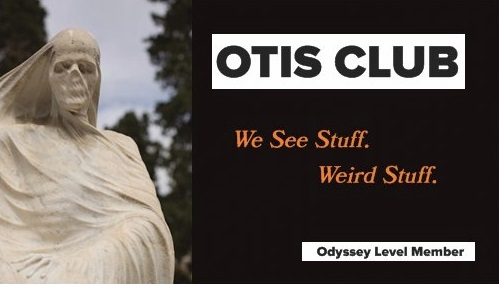 But, in my experience, any Diquis Sphere you can get up close with is impressive: Durable enough to touch, ancient enough to inspire awe, and mysterious enough to ponder. You don’t need step pyramids when you have those. Although if you had both, a lot of fun could be had.